Behold! 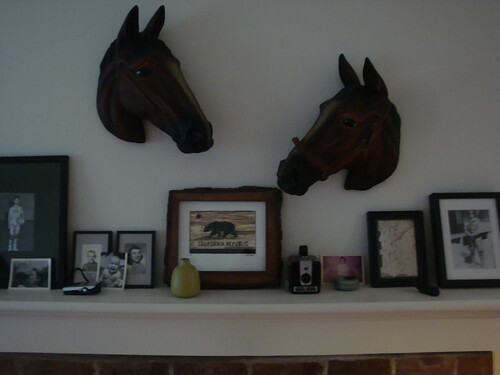 Our mantle bedecked with two gigantic ceramic horse heads! These pretty horses used to hang out in the house of my dearest friend, Sophia, and I was always very vocal about how deeply I coveted them. So when she inexplicably found herself ready to move on (I know! ), she gifted them in our direction. So stinking awesome! The heads had, however, seen some action over the years, and there were some visible wears and tears from old earthquake-slash-small-children-related injuries. I was about ten million months pregnant when I finally got my hot, swollen mitts on them, and I immediately became fixated — with the special intensity of the vastly pregnant — on getting them fixed and hung before the baby came. Meanwhile we’d only just moved into our house, and the stove, dishwasher, and washer-dryer were all still yet to be installed. Also we had no heat. Nor hot water. And I was about a week shy of my due date. So the scene was this: Dirty, sweaty, swearing Marco, feverishly trying to get these major appliances up and running. He’s racing around, the power’s going off and on, and the air is tinged with the delicate scent of what can only be described as “gas leak.” And then there’s me, sitting on the floor, quietly painting in the cracks of some ceramic horse heads with an itty, bitty brush. It seemed important at the time? 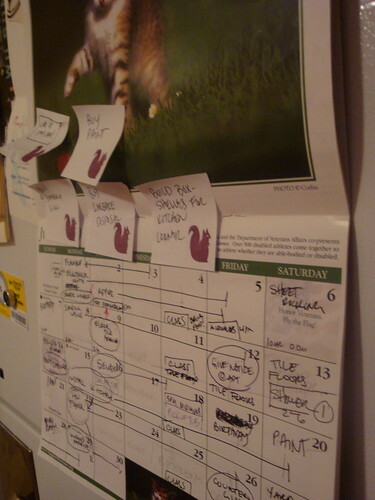 Back when I was about eight months pregnant, we needed the city to sign off on some of plans we had submitted for our ultra ambitious, cliched “pregnant lady in nesting mode” kitchen remodel. The planning department had been sitting on the paperwork for over a month, and we were getting frantic — any delay meant we were in danger of losing our insanely slender-margin-ed race against time to get into the house before the baby arrived. …and I waddled down to the city offices. She shot me a nervous look as I lowered myself into a seat at the counter, closed my eyes, cupped my belly, and started practicing my breathing exercises, slowly and audibly. A few minutes passed, then the lady placed a quiet call, her hand cupped over her mouth. Moments later a man came out from the offices in back, I’m pretty sure he was the head of the whole operation. And just like that, our planning woes were solved. All thanks to the mighty power of the wonder bump! Now we’re looking down the barrel of our big final inspection, and we could really use some magic on our side. But sadly I’ve lost my baby stomach…more or less. 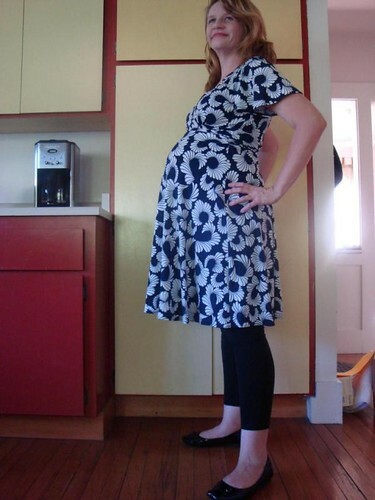 Perhaps it’s time to invest in a prosthetic pregnancy belly? Today was a rough day, one of those “up at 4am” brain-churn days full of frets, tears, and doubts…about my dread of leaving this teeny baby to go back to work at the end of this month, about the maybe brain-scrambling dangers of vaccinations, about the baby’s addiction to adult thumbs and violent swinging, about our ability to pay the mortgage, about the leaky roof and the upcoming rains, about burglars and raccoons and disembodied torsos…everything. Luckily Tuesdays are the day that the ladies from my birthing class gather at a local bakery to chat and pat and coo on each other’s babies. And the fact that I had somewhere to go with all my worries sure did help a lot. It’s a wildly varied group, our birthing class, and I don’t think we would have ever met if we all hadn’t gotten ourselves knocked up around about the same time. But unlike other random gatherings of strangers that life throws at you — traffic school, cuddle parties — the slender overlap of this group’s personal Venn diagrams, i.e., baby-having, has proved itself to be a commonality fertile enough to encourage actual friendships to grow. And it really was such a comfort to be able to sit down today and hear that I wasn’t the only one who was feeling totally overwhelmed by the avalanche of contradicting baby books, or getting freaked out by friends with perfect-sounding babies, or catching themselves fantasizing about doing something ill-advised to their inconsolable babies…such as bounce him off the floor or toss her 600 feet into the air or gently push him deep into a magically permeable wall. See? All perfectly normal. Plus there was chocolate cream pie! I guess I kind of have some things on my mind? So we bought a house. WE BOUGHT A HOUSE! I know…so exciting! But also so, so stressful, my god, really I had no idea. The poring over listings, the touring of 100s of houses, the loan-getting, the deliberating, the bidding, the disappointing crush of getting outbid, the bidding again (and again), the negotiating, the faxing, the signing your name a thousand times, the whole “wiring your entire life savings into the void” thing (that part actually only takes a freakishly speedy five minutes — I complained to the bank teller that it should take at least three hours, just to reflect the gravity of this being probably the most gigantic transaction of my life, but no, you just sign here, sign there, and WHOOSH! My money’s gone! ), the overwhelmed weeping…. Altogether, it’s like a fulltime job. A heart-wrenching, abusive job with horrible hours. And that’s on top of the fulltime job I already have. While pregnant. And not drinking! Had I known how much it was going to take out of me, I never, ever would have done it. But I am glad that we did. I guess? We got a good price, and a great rate, and our payments are relatively sane (for the Bay Area at least). And I really do think that if we hadn’t done it now, it never would have happened, this being the moment where all our planets — low-ish housing prices, enough savings for a down payment, gainful employment, parental aid — aligned into this one miracle opportunity. What with me in my delicate condition, and my knowing less than zero about construction, Marco’s had to take care of everything: Lining up bids, getting permits, digging ditches, tearing down walls, putting up walls, crawling around in the crawl space, cleaning mystery feces (racoon? HUMAN?) out of the attic?! We’ve also had a ton of help. Our friends have turned out in droves to sweat and swing hammers and measure things — it’s like a 24-7 calendar shoot over there. Rob in particular has dipped his oar in so much it makes my heart hurt with happy. And my dad! He’s been truly amazing, drawing up plans and building steps and crawling around in the horror-film crawlspace. I feel so grateful and humbled and small! Despite all the help, things are still really and truly bananas. We’re pinching every penny, constantly examining and reexamining our budget and bank balance. And I never see Marco. He goes straight from work to the house each night, where he slaves until the wee dark hours, and he’s over there every possible working hour of every weekend. Yeah. On top of all this life insanity, we’re also planning to have the baby at home. Huh? Exhibit B: The Surprise Hippie Homebirth Plan! I had every intention of having this baby at the hospital, I really did. As a hippie-hating Marin-reactionary, a homebirth didn’t even vaguely cross my mind. But then I accidentally saw The Business of Being Born, which brought up all these questions and half-remembered tales told by former-birth-center-receptionist and hairdresser-slash-midwife friends. And when I brought my Qs to my OBGYN, I did not like the answers, which were brusque and dismissive and delivered with my doctor’s foot literally out the door. And WHOOSH! Suddenly we’re buying rubber sheets and a special “placenta storage” bowl. So here’s where we are now: Ready or not, the house will become our new home on July 12, our very last day at the apartment. Our due date is on July 22, just ten scant days later. 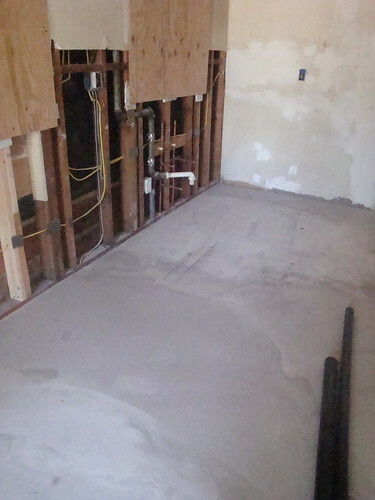 Here’s what our kitchen looks like today. 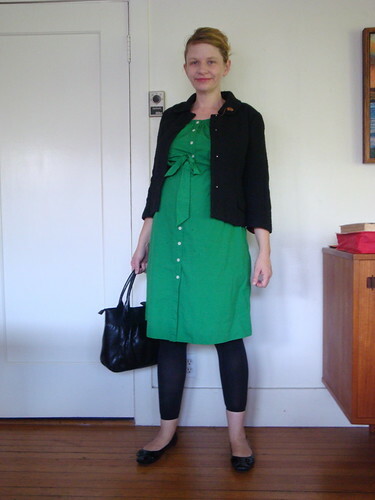 And what I look like today: Profoundly pregnant and primed for popping, and officially 39 years of old. Which will be done first, the house or the time bomb in the oven? I’m sure we’ll be fine. Provided we get the kitchen and toilet and water heater and windows installed. And the walls painted. And the floors refinished. And we pass all our inspections. And the baby doesn’t come early. 1. Don’t let them weigh you. Or rather, let them weigh you, but don’t let them tell you how much you weigh. You may feel a little nuts, shutting your eyes tight as you step onto that scale, and asking “Is it over?” — over and over — before you agree to step down. But the weightless calm that comes from not having that heavy number hanging around your neck is well worth the trouble. And the doctors/midwives will totally let you know you if you’re gaining too much, or too little. Meanwhile you’re free to worry about finding a pediatrician or learning self-hypnosis or getting a fireman to install your car seat or one of the other 10,000 truly terrifying things you’re supposed to be doing this week, oh boy. 2. Hunting for a house, buying a house, and renovating a house are things better done before you get pregnant, or after your child graduates from college, or maybe never ever. Your animal brain may be telling you it’s time to nest, but do no listen! Buying a house is horribly stressful and all-consuming and stressful, and it leaves you with no time to knit booties or smile beatifically or glow or do any of those happy, soft-focus things that pregnant ladies do on television and greeting cards. Just find yourself a dark closet in your apartment, line it with newspaper, and be done with it. 3. That wretchedly named Belly Butter they sell you may not actually do much to ward off stretch marks (apparently that’s all heredity? ), but it makes for some fine-smelling (cocoa and lavender!) and effective hair pomade…for people with uncontrollable fuzzy troll-doll hair, at least. 4. Watermelon! Chinese chicken salad! Tangerines! Chocolate milk! S’MORES! Tums.